Ready to see Raiser's Edge NXTTM in action? For the invincible, unstoppable you. For over 25 years, Raiser’s Edge has been a leader in fundraising and relationship management for nonprofits. With the launch of Raiser's Edge NXTTM, we’re ushering in a new age of performance and support for our customers—the first truly comprehensive, cloud-based solution built specifically for the needs and desires of the nonprofit community. Smart. All-inclusive. Fully integrated on one cloud platform. Raiser’s Edge NXT is a fundraising & supporter management solution that provides nonprofits with the infrastructure to achieve sustainable growth. Beyond combining the world’s leading relationship management for nonprofits with powerful analytics and data enrichment tools, Raiser's Edge NXT also brings your people and your processes together in a single environment, offering ongoing training, technical support, and a robust customer community to help every member of your team make the most of your resources and opportunities. Is your CRM solution worth it? Use our ROI calculator to see your potential for growth using Raiser's Edge NXT. You may be surprised by how much you can gain for your cause. Find missing contact information, such as mailing and email addresses, so your organization can reach more prospects. Drive new revenue from online donations, memberships and events –payments are processed and posted automatically. Email marketing and direct mail make it easy to engage with supporters and easily understand the impact of campaigns. Promote and manage your events, from attendee invites to registration & processing either before or day of event. Make sure the day runs smoothly with RSVPs, seating charts, processing payments, mobile and eliminate paper. Discover donors at risk of lapsing & provide the tools to grow recurring donor revenue. Target top prospects to solicit for major gifts and prioritize the actions needed to upgrade donor revenue. Empower evangelists to raise money on behalf of your organization to expand your base of supporters. Store all supporter info to provide one view of relationships & performance across the organization. Delivered by Blackbaud Sky, create a scalable, secure, global environment that makes it easy to access information and connect with other solutions. We’ll guide you through a proven path to success, based on 30 years of expertise in helping nonprofits to achieve real outcomes and results. Access key supporter insights and dashboards, so you can break down silos and barriers that can hinder the decision making process. Find and reach untapped, multi-generational supporters through Blackbaud’s unique combination of strategies, analytics, expertise and technology. Deliver the right message at the right time through the right channel with integrated multi-channel techniques and tools. Easily convert engaged supporters into donors with best practice giving tools and simple, integrated payment processing. Learn best practices in retaining supporters by reading tips from industry leaders and peers in Blackbaud’s Communities and blogs. Raise more from your supporters with embedded ask analytics and a personalized, targeted approach to your fundraising strategy. Expand and amplify your message with built-in social sharing best practices and capabilities. One scalable web-based platform provides continuous improvements and seamlessly powers everything on-the-go from any device. Bring your organization together, with role-based work centers built specifically to help track individual and team performance, manage portfolios and quickly see last touch points. Smart, prescriptive set up so the information surfaced to you is based on your goals, preferences and activities in the system. Discover opportunities faster, Share knowledge across your organization, and Act on gained insights to drive results. Dashboards visualize the performance of actions, campaigns, appeals, and other areas. Nothing matters more than making sure you’re able to meet your commitments to your mission, to your team, and to yourself. 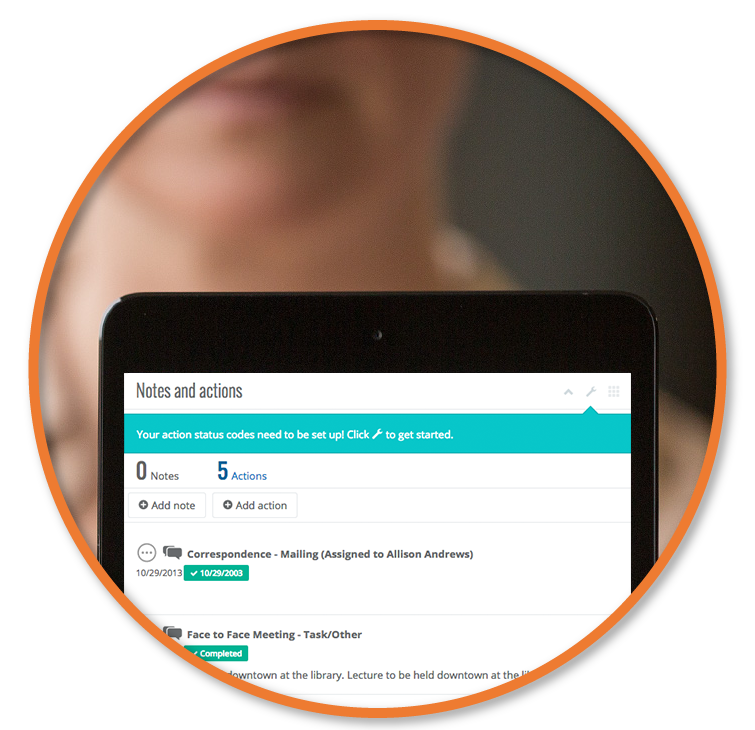 With one view of results you’ll make better decisions & collaboration more. Your days begin and end with one main focus: raising the money and support required to fund your mission. With one seamless experience, you’ll have all the tools you need to drive new revenue. You are the voice of the organization. Day in and day out, you are dedicated to raising awareness for your mission, driving donor engagement, and building trust with your donor base. You are responsible for developing and maintaining a business model that produces sustained, exceptional mission impact and for providing transparency to your organization’s financial health. The integrity and reliability of your database is the lifeblood of your organization. As it’s steward, your primary goal is to ensure data is clean, robust and usable. You now have one place for all of your data with no manual entry. Staff members from Children's Home + Aid share their challenges and the strategies they’ve employed to meet—and exceed—their goals using Raiser’s Edge NXT. Children’s Home + Aid delivers foster care, adoption services, early childhood education, family counseling, and youth services in nearly 60 Illinois counties—a complex and impactful mission that requires both heart and smarts. Hear firsthand from Children’s Home + Aid staff members working both behind the scenes and in the field about how they are leveraging technology to improve their work and better serve their cause. Raiser’s Edge NXT is a holistic solution— with online, analytics, payments support, and training in one subscription price. Get started quickly with minimal upfront investment and comprehensive, value-added packages that reduce the need to purchase add on modules. Register for our upcoming webinar to learn more and see the solution in action. Already Using Raiser’s Edge (7)? For existing Raiser’s Edge 7 customers, we understand the investment you’ve made and are committed to making the transition to Raiser’s Edge NXT attractive and easy for you. Register for our upcoming webinar to learn more and see the solution in action. We will get in touch soon. Thank you!